The National Conference of State Legislatures (NCSL), the bipartisan organization representing the legislatures of U.S. states, commonwealths and territories, sent a letter to congressional leaders urging passage of the Synthetics Trafficking and Overdose Prevention (STOP) Act in order to help stem the flow or opioids and other illicit substances entering the country through the mail. In a letter to House Committee on Homeland Security Chair Michael McCaul, Department of Homeland Security Secretary Jeh Johnson gave the figure of approximately 340 million mail parcels that arrived from foreign postal operators without advance electronic manifest data in fiscal year 2014. Over the course of ASAP’s first year as a coalition, incredible progress towards closing the postal loophole has been made at both a state and federal level, and in both the executive and legislative branch. This document outlines the key moments surrounding the postal loophole and STOP Act beginning in September 2016. Governor Tom Ridge, ASAP senior advisor and the first secretary of the U.S. Department of Homeland Security, penned a letter urging Food and Drug Administration (FDA) Commissioner Scott Gottlieb to work with President Trump and Congress to require advance electronic data on all packages shipped to the U.S. from abroad. In a letter sent to the United States House Committee on Ways and Means, ASAP urges committee members to pass the STOP Act, requiring the United States Postal Service to provide critically important advance electronic data to U.S. Customs and Border Protection for packages coming into the U.S. through the postal system. On September 28, 2017, Americans for Securing All Packages submitted comments to the President’s Commission on Combating Drug Addiction and the Opioid Crisis advising action to close the postal loophole and cut off the pipeline of opioids it facilitates. In a letter to Representative Pat Tiberi (R-OH), the American Medical Association expresses its support for the Synthetics Trafficking and Overdose Prevention (STOP) Act. 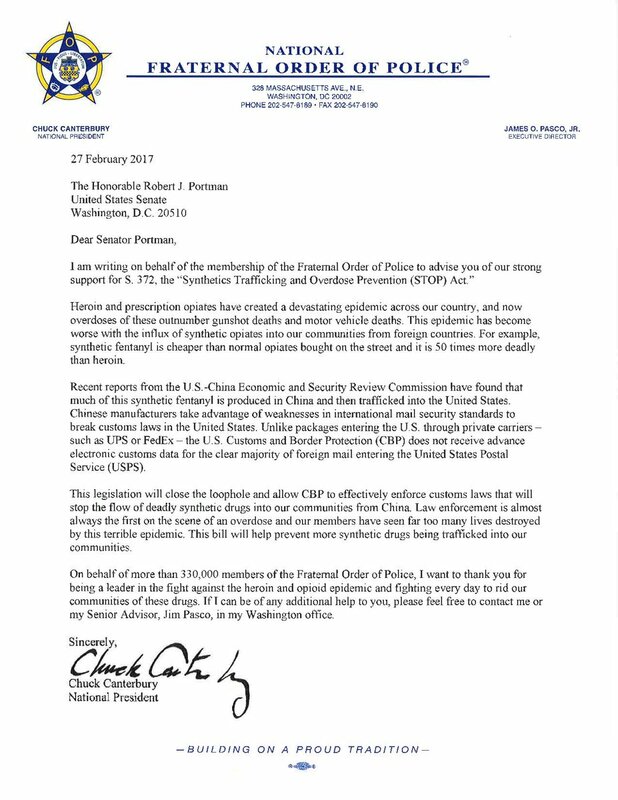 In a letter to Senator Rob Portman (R-OH), the National Fraternal Order of Police expresses its support for the Synthetics Trafficking and Overdose Prevention (STOP) Act. The U.S.- China Economic and Security Review Commission released a report on the influx of deadly fentanyl and other synthetic drugs that are shipped to the United States – often through the global postal system – and are fueling the nationwide opioid epidemic. The inauguration of President Donald Trump marks a new beginning for national security policy in the United States, but a dangerous vulnerability in the global postal system persists threatening the safety of Americans every single day. Nearly one million packages enter into the United States every day without important electronic security data that would allow law enforcement officials to seize dangerous packages shipped from foreign posts. These packages are fueling America’s opioid epidemic by allowing deadly materials to reach our shores unchecked through the global postal system. The White House’s Office of the U.S. Intellectual Property Enforcement Coordinator (IPEC), in cooperation with the U.S. State Department, called for action to close a loophole in the global postal system. In its 2017-2019 U.S. Joint Strategic Plan on Intellectual Property Enforcement, the plan recognizes that this loophole provides a pipeline for illicit materials “that place the health and safety of consumers at risk; jeopardize national security interests; undermine the rule of law; accrue to the benefit of criminal syndicates; and implicate serious ethical and social concerns.” In addition to calling for further research and study, IPEC calls for an evaluation of the CBP-USPS advance data pilot program in order to target vulnerabilities and recommend improvements. The relevant section can be found on page 99 of the report. PRI’s The World covers the spread of carfentanil, the synthetic opioid designed as a elephant tranquilizer that is now a major contributor to opioid deaths in the U.S. ASAP Senior Advisor Juliette Kayyem speaks on how the loophole in the global postal system has provided a path for carfentanil and other deadly drugs to easily enter communities across the country. A letter from the Senate Finance Committee to Secretary of State John Kerry stated that packages that enter the U.S. from foreign posts are not subject to the same screening standards as packages shipped by private carriers. U.S. Customs and Border Protection (CBP) does not receive electronic security data for the vast majority of this type of mail, which greatly reduces the agency’s ability to intercept illegal drugs and dangerous or counterfeit goods. Speaking at a hearing on “Effective Enforcement of U.S. Trade Laws” before the U.S. House of Representatives Committee on Ways and Means Subcommittee on Trade, Customs and Border Protection Commissioner Gil Kerlikowske discussed the importance of manifest data as a critical tool for CBP to detect potential risks in shipments. LegitScript, the leading verification and monitoring service for online pharmacies, analyzed how illegal drugs are shipped into the United States from illegal online pharmacies, ultimately finding that 100 percent of the shippers used foreign posts over private carriers. Zero percent of the test deliveries were seized by authorities. In response to a terrorist plot involving bombs disguised as toner cartridges shipped from Yemen to detonate over Chicago that was successfully foiled using intelligence data, U.S. Customs and Border Protection created the Air Cargo Advance Screening (ACAS) data program. While private carriers have conformed to the new requirements implemented in the program, foreign posts have not followed suit. Copenhagen Economics conducted a study revealing the security gap between packages shipped via private shipping companies versus foreign postal services. The study found that foreign postal services do not submit any advance electronic security data on packages sent into the United States, presenting a major security risk. Every day, nearly one million packages are shipped to the United States from foreign posts without adequate security screening. Many of these packages contain deadly synthetic drugs and are increasingly contributing to the opioid epidemic that kills approximately 78 people every single day. Recent studies have proven this vulnerability in the postal system makes it easy for powerful, deadly substances like carfentanil to reach U.S. shores. Americans for Securing All Packages (ASAP) is committed to closing the loophole which allows synthetic opioids to reach communities across the United States through the global postal system. To underscore the need to close this loophole now, we have compiled a snapshot of recent news, facts and updates related to the epidemic. As the opiate epidemic claims lives in historic numbers across the country, Americans for Securing All Packages is committed to closing the pipeline that allows illicit, dangerous and often deadly drugs into the United States. To express the severity of the crisis and the need to take immediate action, ASAP has assembled a snapshot of recent news, facts, and updates related to the epidemic.